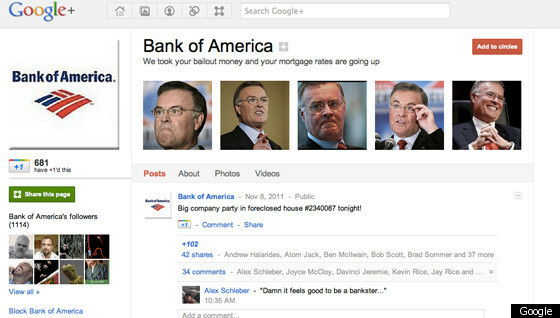 A Google+ account titled “Bank of America” posted a series of updates last week mocking homeowners who couldn’t pay their mortgages. “Big company party in foreclosed house #2340087 tonight!” read one post. Another warned Occupy Wall street protesters, "You will sit down and shut up, or we will foreclose on you." 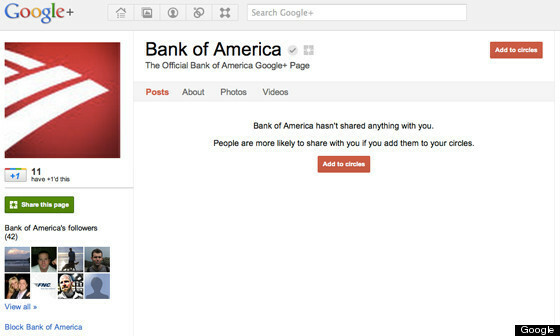 The Google+ profile featured a Bank of America logo, a link to the bank’s website, and the address and phone number of its New York headquarters. And though it boasted the same name as Bank of America’s official page -- it was a fake. Bank of America is one of several high-profile brands, including Disney, that have had their identities usurped on Google+ by users impersonating the companies. The flap makes Bank of America look bad -- but it makes Google look far worse. BofA's fake profile marks the latest in a series of stumbles Google has taken while trying to breathe life into Google+, its Facebook competitor, and woo businesses back onto the service after booting them just weeks after the site’s launch in June. Google+ is hardly the first social network forced to grapple with parody accounts linked with household brands. Recall, for example, the popularity of the fake "BP Public Relations" account on Twitter, which tweeted snide comments about dead sea-life and the BP oil spill. And the issue is a thorny one for web companies, who can find themselves swamped with complaints over content on their platforms and policing millions of users. But Google+ is also not the first social network, and it has had years to watch and learn from other firms' mistakes. But the company seems caught off guard while confronting with the problems that have plagued other social media sites for nearly a decade. The web giant's string of missteps with Google+, forgivable for a startup, are problematic for a company of its size and stature, say experts, who warn Google risks alienating brands from its service at a time when it needs them most. "When it comes to launching Google+ and getting brands excited, they've dropped the ball. They'll need to do damage control," said Shama Kabani, CEO of The Marketing Zen Group, a digital marketing firm. "It all seems very haphazard. You expect more from Google, a company at their level." Google+ has had a rocky relationship with brands since its debut. At first, businesses jumped at the opportunity to set up shop on Google+. The Internet giant responded by deleting brand pages seemingly at random, allowing some to stay on for days, while other profiles were pulled almost immediately. It took Google months to launch its official brand pages, and now it appears Google+ lacks an adequate way to cope with online imposters hijacking businesses’ identities. At the same time, however, Google launched a crackdown on profiles created under fake names or nicknames, deleting many users' accounts in a move that sparked outrage online. Google's scrutiny of pseudonyms seems at odds with the fake brand pages that have been allowed to stay. The launch of Google+ "felt like the way Google rolls out lots of products -- throw it out there and modify on the fly," said Christopher Barcelona, the executive creative director of Resource Interactive. "I think the stakes in this particular instance are too high not to be more strategic in this roll out." Google removed the fake Bank of America page on Tuesday, though not before it had posted updates for a full week, accumulating over 1,200 followers -- more than 10 times the number following the official Bank of America account. A Google spokeswoman told The Huffington Post that Google has taken measures to crack down on brand impersonators. For example, the company distinguishes official brand pages from fake accounts by awarding them a "verified name" badge that appears as a small gray checkmark next to the page’s title. The spokeswoman also noted that there is no way to apply for the designation and that Google will be "proactively reaching out to companies" to give them badges, starting with "well known global brands." The approach is similar to Twitter's, which hands out badges to "verified accounts" at its own discretion. Though Google has an internal team in place to handle complaints, the web giant will also rely on its users to report fraudulent profiles, the spokeswoman said. In addition, the company can track the authenticity of a Google+ account by monitoring whether it has been linked to a brand's official site. The tone of parody pages will help determine whether they can remain, and, according to Google’s spokeswoman, "Satire is definitely appropriate.” This raises the question: Should the fake Bank of America account, which described itself as “committed to making as much money as possible from usury, coercion, bribery, insider trading, extortion, and debit card fees as possible," be allowed to stay? Would anyone have taken it seriously? While Google has measures in place to address reports of fraudulent accounts, it appears not to have instituted a mechanism to keeping users from hijacking brand pages to begin with. IT World's Dan Tynan, who created a fake Walt Disney profile on Google+ in just 10 minutes, observed, "Anybody can register any page for any business, regardless of whether you own the company or any trademarks associated with it." Kabani, the Marketing Zen Group CEO, cautioned that Google might heed complaints from major corporations and crack down on faux-Disney sites, while small and medium sized businesses may find their pleas fall on deaf ears. Yet some countered that companies should bear much of the responsibility for managing their brands online, not Google. "I don't think it's fair to lob all the criticism on Google. It's a shared responsibility between Google and brands, whose responsibility it is to make sure their pages are verified, that customers know how to get to the page, and to keep an eye out for squatters," said Christopher Barcelona, the executive creative officer at Resource Interactive. "It's a two-way street and brands bear a portion of the responsibility."